Morrison Company will specify the proper gate to best suit your VRC system needs. All Wildeck® gates meet applicable codes and are equipped with ‘elevator style’ electro-mechanical door locks for superior performance and durability. 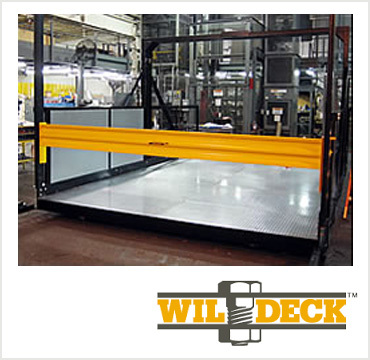 Additionally, carriage mounted gates from Wildeck may be specified for your VRC application to add an extra measure of safety within your warehouse environment. Standard carriages come with painted floors and walls and can be protected with galvanized diamond plate “armor.” All Wildeck specified carriages meet the standard of excellence required by Morrison Company for safety, reliability and durability.